1,400 athletes, 200 young volunteers, 60 adult volunteers…and Crunchy. The Devon Summer School Games is a Level 3 Sainsbury’s School Games event. This means that the children will have competed in an interschool Level 1 competition and then gone on to represent their school at a Level 2 event against other schools in their city/region. 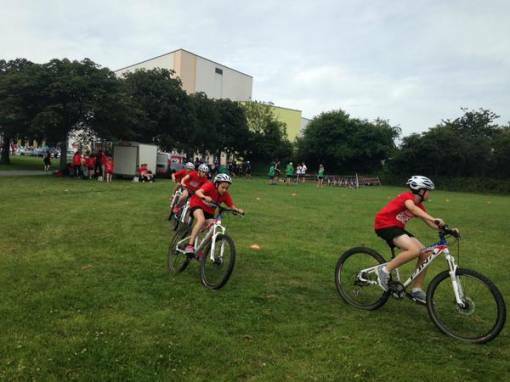 Only the top two schools in each of the Level 2 event were invited to compete at Level 3 Devon Summer School Games, so the children had come a long way already just to be there on the day. The Opening Ceremony was held at Plymouth Albion in the morning. The kids got a shock when Lance Chatfield, School Games Organiser, was rugby-tackled to the ground whilst introducing the Games. The moment of shock and silence was quickly replaced by the screams of Howard Turner and students from Hele’s School performing the Haka to begin the show. A ‘Mascot Relay’ in which some local mascot champions such as Pilgrim Pete and Grecian the Lion took on Crunchy the School Games Mascot, who was created from the winning design in a competition for local children. The Games was attended by a Sporting Champion - Olympian and World Champion rower Annie Vernon. Annie answered some questions and gave a short speech to all of the athletes, praising them for making it to the Games and encouraging them to take pride in themselves, their schools and regions whilst competing and just to try their best and enjoy the event. Annie then visited all of the events at Brickfields and Plymouth Life Centre/Central Park to watch and meet the athletes and the young leaders who are so vital to the running of such a huge event. Every athlete was given a t-shirt in the colour of their area, to give them a sense of being a part of their regional team and representing their area; Plymouth (purple) , Dartmoor (red) , St. Luke’s (blue), West Devon and South Hams (green), East Devon (grey) , North Devon (orange), and Torbay (turquoise) . It made for a very colourful competition! Inclusion events are for young people with different abilities. During the competitions the leaders of each event watch the children and look for examples of the Spirit of the Games. The athletes were awarded a special medal and wristband if they demonstrated an exceptional example that the leaders thought was worthy of praise. It was a tough choice in many of the events so a big congratulations to all who were selected. To all of the athletes and their teachers; who travelled to the event to compete. Their determination, enthusiasm and enjoyment made it a brilliant occasion. To all of the SGO’s in Devon; such large events do not happen without months of preparation, co-ordination, hundreds of emails and numerous events and tournaments in their region. To Active Devon; the funding partners of the event, and came to assist with the set-ups and organisation on the day. To Sainsbury’s Marsh Mills: who kindly donated water and bananas for the kids and young leaders on the day, and have decided they would like to support future events. We look forward to having you. To the young leaders; all of the young leaders who helped on the day have also previously assisted at Level 2 events and given up their own time. There is no way we would have been able to run such a successful event without them. In Plymouth we have an ethos of “For Young People, By Young People” and that was certainly evident on the day.